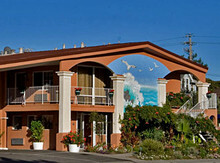 Alive with the quaint, seaside character of Santa Cruz, the Continental Inn is a charming hotel just minutes from downtown Santa Cruz and the famous Beach Boardwalk. Downtown Santa Cruz is rich with eclectic shops, quirky coffeehouses, fabulous restaurants and unique bars, all of which are walking distance from the Continental Inn, making it a wonderful value for business and leisure guests who want to enjoy this renowned coastal California town. 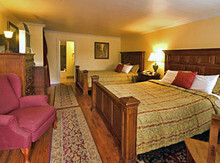 The traditional guestrooms are warm and comfortable, designed to meet the needs of every guest with an array of modern amenities, such as satellite television, wireless Internet access, microwaves, refrigerators, individual climate control and spacious bathrooms with luxurious granite vanities. For added luxury, guests can select one of the boutique queen or king guestrooms, which feature all the same amenities as the traditional rooms and also offer elegantly stylish sleigh beds, wood floors and fine linens. All guests will also enjoy amenities like access to the seasonally heated pool and hot tub, daily complimentary continental breakfasts and complimentary morning newspapers. 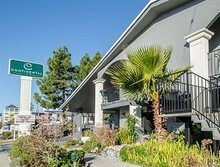 The reasonable rates, delightful accommodations and proximity to all of Santa Cruz's most popular attractions make the Continental Inn a rare and wonderful find. Though Santa Cruz County has long been a renowned destination for top-notch surfing, it is also hailed as a northern California jewel for stunning redwood forests, celebrated wineries and world-class restaurants. Within a short drive of the Continental Inn, guests will find gorgeous coastal towns like Capitola, Half Moon Bay and Monterey. San Jose, Santa Clara and classy towns like Los Gatos and Saratoga are also accessible via a 30-minute drive through the woods along scenic highway 17.